SOLD: Congratulations Meg and Eliza in Portland! Noki is a sweet, smart and willing young man with a good foundation and a positive attitude. 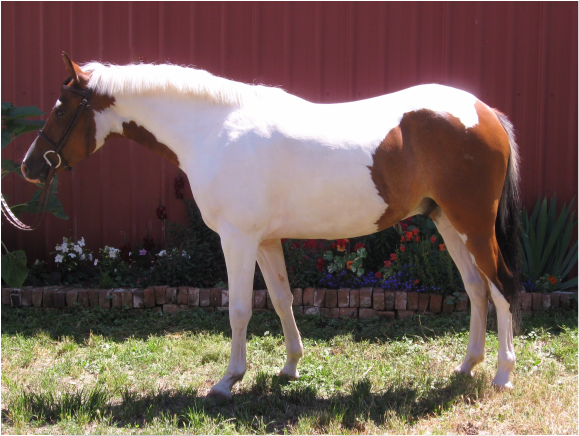 A three year old Arabian X Pony, he will mature 14.-14.2, the perfect size for a child or small adult. He was lightly backed as a two year old, and has been started under saddle this summer. He has never offered to buck while ridden, and is a willing pupil. His Pinto registration papers are waiting for his new owner to fill out. Noki is trusting, and has had good handling with experienced horse people since birth. He has good ground manners, puts his head down for halter and bridle, ties, loads, hauls, bathes. As a yearling, he participated in an in-hand trail competition and did very well. He is an EASY, uncomplicated pony. There is a video on you tube of his third ride: the first time trotting under saddle. He was cheerful and never put a foot wrong. Or, Search youtube for: whetstonefarm (all one word), or Noki free jumping.